For the last four years, Jack Lew (and L’il Tim Geithner before him) have been lining their Money Bin with the profits earned after Hank Paulson bailed out Fannie Mae and Freddie Mac. And we mean all of the profits, which will no doubt go towards sending every single illegal immigrant in the land to Harvard or Disneyland or something. The mortgage giants’ shareholders thought that this wasn’t right (as it certainly wasn’t for them), and sued over it—and confidently, at that. But that, perhaps, is because they didn’t notice Section 4623 of Title 12 of the U.S. Code, which may or may not be (but probably is) extremely problematic for anyone suing the government for doing anything vis-à-vis Fannie Mae and Freddie Mac, as old friend John Carney points out. The provision seems to pretty blatantly deprive the courts of the authority to do almost anything to interfere with the FHFA’s decisions with respect to Fannie and Freddie. If that’s what this provision of the law does, it would likely mean that the investors will lose this case outright. Of course, it might not matter, although federal appeals court judges aren’t known for asking for extra reading on an issue that does not matter. But let’s say they just want to put a little extra scratch in old buddy Ted Olson’s pocket and that there’s another hidden section of the Code that says “psych on Section 4623!” or something. Well, things might still not be great for those wanting to take their bailed-out company back, because that slam-dunk piece of evidence that emerged last week—you know, the one where Fannie’s CFO said she told the Treasury that her company was about to begin printing money once again, just before the Treasury decided to take all of the money it printed? Yea, seems she was somewhat more equivocal about Fannie’s rosy future when speaking publicly. 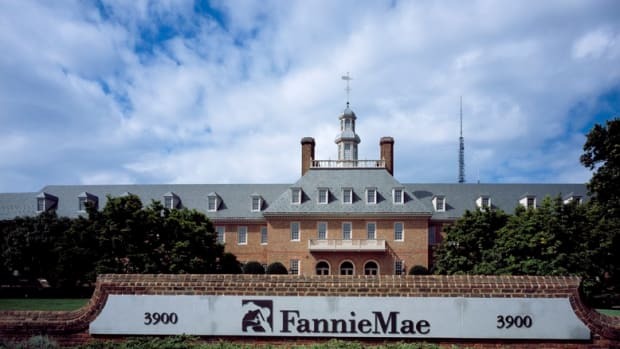 Fannie and Freddie had said that “we do not expect to generate net income or comprehensive income in excess of our annual dividend obligations to the Treasury over the long-term. We also expect that , over time, our dividend obligation to Treasury will increasingly drive our future draws under” the bailout terms, the judge said. “So the week before, whatever it is, 10 days before the trigger is pulled, both of the GSE’s go out with their 10-Qs and say, ‘We have no future,’” the judge said…. Of note, the statement quoted by Judge Ginsburg supports what Ms. McFarland told the Wall Street Journal in August of 2012. “It’s hard for me to envision that we would be able to make enough every single quarter to cover the dividend payment,” said Ms. McFarland.